In what continues to be somewhat of a family tradition, my immediate family gets together on Christmas Eve for a Christmas celebration. We seem to be on a two year cycle as we hosted in 2008 and 2009, and my younger sister hosted in 2010 and again this year. Sonja had been on vacation in New York over the last week and was scheduled to get back around lunch time today. Unfortunately, with a series of cancelled and delayed flights, she didn’t arrive until late in the evening. Of course she was on a flight during most of this, so she wasn’t going to receive the pictures until she landed. When she did finally arrive, she called and I went to pick her up. It was during this time that she received said pictures. Amazingly, from the time that she called to me arriving to pick her up, her mood had dropped from happy-to-be-home to fairly depressed about Christmas. It was hard, but I played it cool and apologized for my family being so anxious to open her presents, and asked if there was anything I could do? When we got back to my sister’s house, we let her in on the joke. Suddenly a bright and happy Sonja returned! 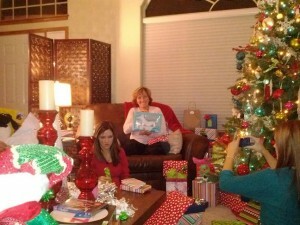 I think that made Christmas twice as good for her… even though she repeatedly told us all how mean we were. Best Christmas prank… ever. I don’t want to waI was hoping we can push our update call to later in the week… say Thursday or Friday. Yes, you are all VERY mean.